For beginners to skiing, you’ll be happy to know that finding the right pair of skis is easy, but there are a few things you need to consider before exchanging money. We have put together a few points to remember when buying skis, so you are all ready to hit the slopes for your chalet ski holidays. There is no one perfect size for a skier, though your height and weight are a starting point for choosing skis. However, your ability, the snow type, and terrain and also personal preference are other things to also take into account. The general rule is to pick a ski length somewhere between the top of your head and chin. Advanced skiers may go longer, and beginners may want to go for shorter. You may also want shorter skis if you are lighter than average for your height, don’t like to ski fast, and prefer quick, short turns. The width of your ski contributes to its performance: a narrow ski offers quicker turns, and wider skis gives better performance on powder. Ski width is also measured at the middle of the ski, known as the waist, as this is the narrowest point. It is best to opt for a width that is suited for the type of skiing you will be doing, though wider skis are becoming more popular for all-mountain and piste skis as technology improves. Though improvement in technology means your ability to ski is not very relevant when buying or hiring skis, it is a good aspect to consider. Think about your ability in terms of beginner, intermediate and advanced. Beginners may prefer a ski with a softer flex, and designs such as carving which allow for easier turns and control. What about medium and advanced? It sounds like a list starts. Camber profile refers to the curve of the ski from tip to tail. 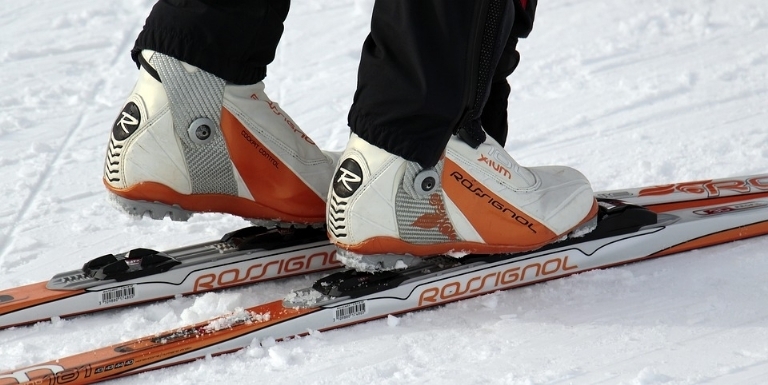 Manufacturers produce a variety of camber profiles for different styles of skiing. For cruising pistes and riding pipes, a traditional positive camber ski is recommended, and for more advanced and freestyle skiing, there are plenty of alternatives – a retailer can help you out. For beginners, a positive camber is usually the best option. A positive camber ski has a smooth arch, with contact points at the tip and tail, so when a rider’s weight is added, the pressure is even. Where you will be skiing is possibly the biggest factor in choosing your skis. There are several terrain categories to choose from, and we have listed the three most popular for beginners below. All-Mountain: All-mountain skis are for skiing the whole mountain, and the most popular type of ski. They have been designed to handle everything from powder to heavy snow. If you want a ski that can do it all, all-mountain skis are the ones to go for, as opposed to a ski suited for one terrain. Powder: Skis for powder are needed to help you stay afloat when on the hunt for fresh snow. They are wide and have a soft rise and soft flex. Piste: Piste skis have a narrow waist and a shorter turn. Beginner to intermediate skis are designed to make it easy with a certain flexibility, and as you advance in your piste ability, the skis get stiffer and more aggressive. It is also important to look at bindings when choosing your skis. Different bindings suit different skiers, and it is essential to check the bindings you choose are adapted to the skis and type of skiing you’ll do. A lot of skis do come with bindings, meaning you won’t usually have to worry as the bindings have already been correctly selected. There are two main methods of mounting bindings to skis – track and drill. Track mounted bindings can be positioned to fir the size of your ski boots, and can be attached at home, and have been designed for the ski. Drill mounted bindings must be drilled and glued professionally to the ski. Benefits of drill mounting your binding is it means you can choose the ones you want for your skis, and your feet are closer you the deck of the ski, giving you a better feel and control. Contact us today to find out about Christmas, New Year and ski season bookings, and be sure to keep an eye our social channels for updates on the blog.